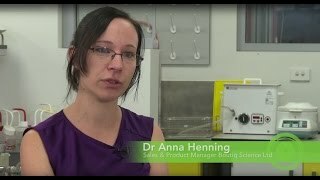 Dr Anna Henning has enthusiastically embraced the commercialisation of her own nanomaterials research and that of her wider research group, by taking on lead responsibility for technical R&D, marketing and sales activities within Victoria University of Wellington start-up company Boutiq Science Ltd. Dr Henning graduated with a PhD in Chemistry, on the synthesis of shaped bimetallic nanocrystals for use as catalysts, from Victoria University of Wellington in 2013. Her research and the research from her nanomaterials group (supervised by Associate Professor Richard Tilley) was identified as having commercial application. She has since made a swift transition from full time PhD researcher to head of sales and product development for Boutiq, readily gaining in commercial acumen and excelling in her new role. Under her technical management and with CEO Paul Atkins, Boutiq already have a range of industry customers and partners for its unique nanoparticles which are available to scientists and engineers wishing to integrate cutting edge materials into their research and development. The biomedical market is a focus with cancer diagnostics, imaging agents, and drug delivery identified as key areas.